Background Info: This condo, in the Olde Mill neighborhood of Northern Indianapolis and built in the late 80’s, was a unique project. The homeowners owned two neighboring condos and wanted to create one space to have more room for family and friends to visit. As highlighted in the previous Blueprint for Improvement, the two condos were small and divided. There were two kitchens that were dated and felt dark and confined. The bathrooms had never been updated and lacked functionality. We previously highlighted the larger kitchen remodel, but now we will highlight the remaining kitchen and master bathroom that also were included in the remodel. The homeowners decided to keep two kitchens in the now joint condo. The second kitchen was updated with all new cabinetry, countertops and flooring. One section of the cabinetry was removed, and floating shelves were incorporated for a more modern design. 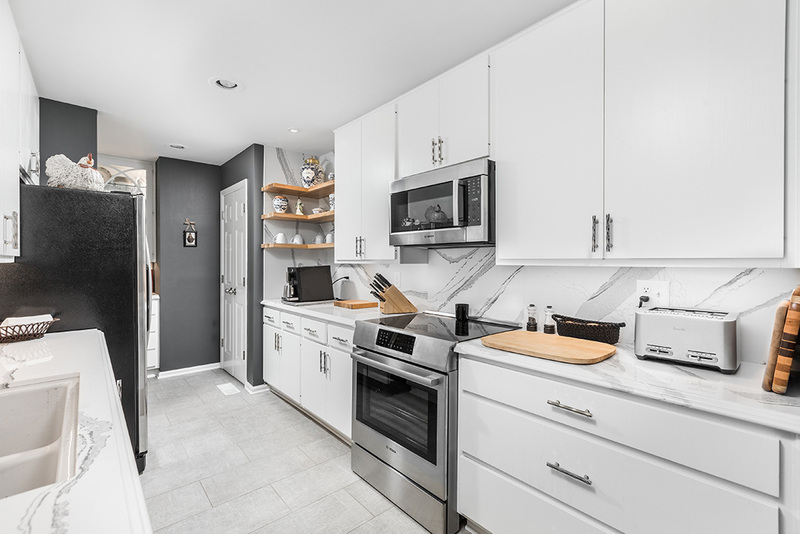 Not only were the countertops upgraded to quartz, but the same material also was incorporated as the backsplash, carrying its beautiful veining through the kitchen. The master bathroom materials were completely updated, and a steam unit was added to the homeowners’ new custom-tile shower for a spa-like experience. Follow us on social media for more details on this expansive condo remodel!